How does one learn a new skill, like snowboarding? Watching a video or listening to an experienced friend often help, but one doesn’t truly learn to carve snow until they put the words into practice and strap the board to their boots. What makes learning science as a skill any different? Sure, knowing the charts and memorizing the numbers can help you pass the class, but actually applying the knowledge to unanswered problems and doing the experiments are what make scientists. Drs. 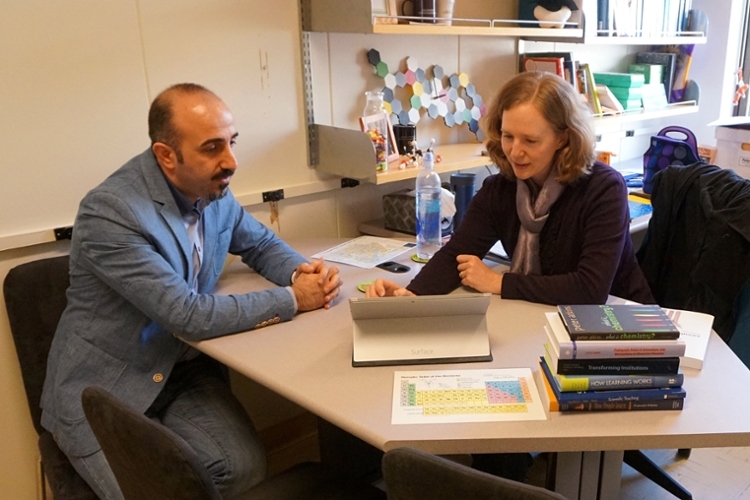 Julia Chamberlain and Ozcan Gulacar bring these same ideas to their classrooms, where they use active learning strategies to help students apply knowledge and practice problem solving as they learn general chemistry. The two were hired by the Chemistry Department in July 2015 as lecturers with potential for security of employment (LPSOE). One can think of the title as similar to a tenure-track teaching professor. However, instead of researching chemistry as a scientific field, they research how students learn chemistry and what tools can be used in the classroom to help students learn more effectively. Here at UC Davis, her research includes incorporating education technology in the classroom. She asks questions such as, “What advantages do different technologies bring, and how do we leverage those benefits for teaching chemistry?” Both researchers are interested in strengthening a student’s understanding of chemistry by giving students opportunities to practice what they are learning in class, where the instructor can provide feedback. Although not traditionally part of a chemistry lecture, feedback is crucial for learning a new skill. Snowboarders know that from their first time eating snow to their last big air bail--falling down provides feedback that helps one correct balance, build muscle memory, and better read the slope on the next run. Making mistakes is vital for improvement. In the chemistry classroom, Drs. Chamberlain and Gulacar spend less time lecturing and more time engaging students in problem solving exercises, so that mistakes and misunderstandings can be actively addressed and learned from. Teaching effectively to one of the nation’s largest general chemistry-taking undergrad populations is not an easy feat. It takes the passion, patience and practice of dedicated researchers, instructors and graduate students alike to bring an education to students that will not only promote more placement in STEM careers, but also promote the advancement of technologies to help solve continuing world issues such as global climate change and developing sustainable energy. So whether you’re hitting the slopes or performing your first acid-base titration, do your research beforehand, stay attentive to those who have the patience to build you up, and don’t be afraid to make mistakes--they’ll only make you better. UC Davis instructors have your best interest in mind.